As it is tradition, each December we bring you a delicious sparkling wine to toast the holidays, and this month is no different. We had the pleasure of meeting Pieter Ferreira, winemaker for Graham back in September when we were able to sample the whole range of their sparkling wines but when we tasted this vintage, we knew we had our wine!!. The family‐owned Graham Beck is a Certified Sustainable winery situated about 5 miles from the charming town of Robertson about 86 miles from Cape Town.Graham Beck Wines is the only South African winery to have received three internationally recognized environmental and business ethics accreditations: "Championship Status" from the Biodiversity Winery Initiative for conservation practices and initiatives, (for every acre they plant, they conserve 4) Certified ISO 14001 for environmental sustainability practices and Accredited and Founding Member of The Wine Industry Ethical Trade Association, dedicated to the promotion and practice of "fair trade" in the agricultural industry.The sparkling wines of Graham Beck are iconic wines in South Africa and abroad. Their sparkling wines were served at Nelson Mandela’s historic presidential inauguration and in our own White House too. Their style of sparkling wine is known in South Africa as “Cap Classique” and is their version of Methode Champenoise native of Champagne, France. This particular wine is a delicious blend of 82% Pinot Noir and 18% Chardonnay from a single vintage and from their own coastal estate. Both lots were pressed together and allowed to ferment with the lees.The wine is then bottled for the second fermentation which is allowed to rest for 36 months…much longer than some champagnes, and the tiny bubbles achieved with this lengthy aging will reward you! Chill this wine and carefully point the bottle away from pets and people as you pop the cork. The bubbly has salmon pink hues with tiny little creamy bubbles rising to the top carrying notes of strawberries, cream and raspberry sherbet. The wine is crisp and clean to the palate with the notes of raspberries, strawberries and a creamy texture from the bubbles that will surely keep you reaching for another sip. This wine is a delicious way to begin any festivity or toast a special occasion and at this price, we are sure it will become a favorite in many of your homes. To make this bubbly even more special, we are Anne’s are including in your shipment this month a champagne stopper (along with the new wine carrying bag) as a way to say thank you for being a member of our club. Happy holidays and cheers! Spanish reds seem to be on the wish list of many of our wine club members, and we have heard you. 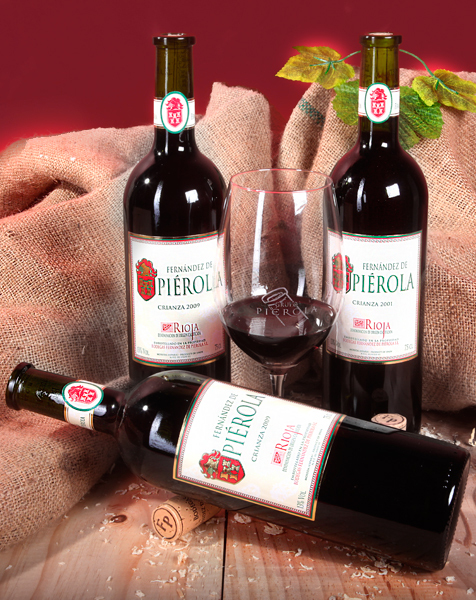 First, let us introduce you to your primary red for the month of December: the Fernández de Piérola Crianza! A small family wineryfounded in 1996 with the aim of producing quality wines with a personality different from the standardized taste of most Rioja wines. With family vineyards in Moreda (Rioja Alavesa), a traditional winemaking region, they produce wines using only grapes originating from their own vineyards and from vineyards within the town of Moreda(50/50) With singular microclimatic conditions and hillsides orientated towards the south, which allows suitable sunlight, poor, clayey - calcareous soils, of scarce production, important temperature swings between day and night, create the ideal conditions that grow Tempranillo that make superb wines. The winery also showcases their quality via their innovative bottles. Notice the shape of the elongated neck with a lip, made that way to reduce dripping as you pour glass after glass, and additionally they omitted the foil covering the neck, so the consumer could see and therefore know the condition of the cork. People who like to age wines and have pulled a cork out in pieces will appreciate this little touch. But let’s talk about this delicious wine…A Crianza wine is wine from Rioja made with Tempranillo, required to spend at least 6 months in oak and 6 in bottle before release. This wine goes further, it spends 18 months in a combination of used French and American oak. Decant the bottle for about ½ hour and notice the intense red cherry color and the aromatic notes of blackberries, raspberries, cedar and a hint of vanilla. The palate has a medium body with the same red fruit notes of raspberry, blackberries and touches of plum. The acid is well balanced with the silky tannins, and that finish will carry on! This wine will make a delicious accompaniment to winter meat stews, steaks or even that Tuesday night burger! Occasionally we come across a wine that has been aging awhile and we jump at the chance of tasting it to see what time has done to new world wines, and with this wine we were so glad we did. Time has served this wine well! But first let’s delve into the world of Bodegas Poesia, this winery is owned by Bordeaux proprietors Helene Garcin and Patrice Leveque, with Leveque doubling as winemaker. Patrice comes from Bordeaux where his family has been involved in wine production for generations, and he has been the winemaking director for Chateau of Vignobles Garcin in France. Helene’s family has been involved in wine production in a different region of France. Together, Helene and Patrice arrived in Argentina in 2002, bringing with them all winemaking equipment from France, including fermentation barrels and oak casks, and a very honed philosophy for Poesia wines: to produce wines with perfect balance between acidity, alcohol, tannins, fruit notes, and mineral notes and finally with a generous amount of aging to achieve and deliver those to you. With this and other wines, this winery has achieved much acclaim from many critics but the most important is you! And we think you’ll love this delicious blend of 45% Malbec, 35% Syrah, and 20% Cabernet Sauvignon. All the grapes are cultivated in a sustainable manner with no pesticides or herbicides (not certified), and each vineyard is reportedly 80 years old. They harvest the grapes by hand and the wine is fermented in stainless steel oak, then the wine is aged in French oak barrels for 12 months and then given an additional 2 years in the bottle before it is released. This bold red has a lovely crimson red notes, displaying aromas of blueberries, cherries, pepper and cedar. This full bodied wine has plenty of savory notes and is well balanced. This wine will make a great companion to beef stews, rustic French cooking or a Argentinian style grilled beef topped off with chimichurri sauce. If you want to go more casual, enjoy it with a spicy sausage pizza or even a burger! Drink this wine now, it is on its prime! This wine comes to us from one of our favorite importers and yours too…Ms. Claire Barroy. Caves de Rauzan Grangeneuve is a winery born out of two separate entities founded in 1930, that merged in 2008 to create the first and largest cooperative of growers and wine producers in the Bordeaux AOC region of France. The cooperative is comprised of 400 small production wine producers who together support each other with sustainable winemaking programs and vineyard development programs. The co-op mainly grows red grapes (83%) but the white grapes used are only those allowed in the Bordeaux region. And from that small allotment comes this aromatic white wine,made from a blend of 75% Sauvignon Blanc and 25% Semillon. All the grapes are hand-picked in the early morning hours to retain the freshness, then fermented in stainless steel tanks and allowed to spend time on the lees. This wine has straw hues with just a hint of pale gold, the nose is brimming with notes of grapefruit, white flowers, and just a hint of oranges. The freshness of this wine hits your palate from the very first sip; the flavors are nicely balanced between the refreshing grapefruit notes to the zippy acidity and a lengthy finish. This wine makes an ideal aperitif, serve it with a plate of soft cheeses, ie. Brie or Chevre. If you want to pair it with a main course, think shrimp scampi over pasta! Cheers!